In the first part of the Australian 50 Cent Coin Value entries I talked about some of the more valuable circulation coins and the relative lack of value of the commemorative 50 cent coins. In this second part I’ll talk about some of the real rarities that you’d be staggeringly lucky to find in your change. Still, the coins exist and if you’re really really lucky you might find one. You might have a better chance of winning the lottery though, so don’t start counting your money just yet. 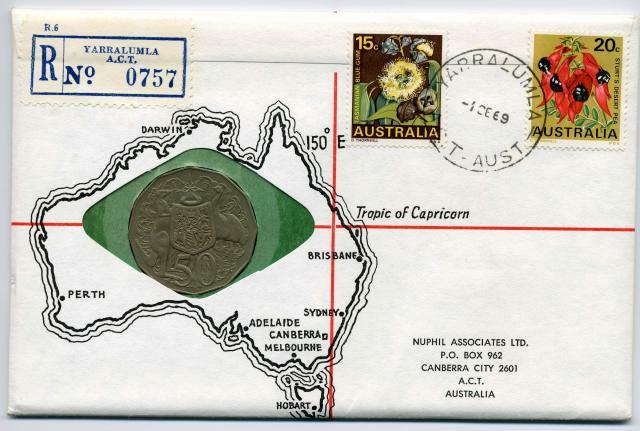 1977 Coat of Arms Reverse – for some reason the Royal Australian Mint released a very small number of 1977 50 cent coins minted with the Coat of Arms reverse rather than the Silver Jubilee reverse. An EF example of one of these is estimated to be worth $4000. 1975 Australian Obverse / Fijian 50 cent Reverse – I’ve seen some references to this coin, but I have no idea of it’s worth or even if it actually exists. The Fijian 50 cent was the same shape as our coin and the RAM actually minted Fijian coins in that year so I guess this could happen. 1988 Coat of Arms Reverse – similar to the 1977 coin, some coins seem to have been minted with the Coat of Arms reverse rather than the First Fleet Bicentenary design. An uncirculated example of one of these sold in 2006 for $5400. 1969 Specimen 50 cent. These were struck for the Yarralumla PNC. 1330 made it into envelopes and possibly others were put into circulation, it is unknown how many. An UNC version is worth $150. 2000 ‘incuse’ Millennium – For whatever reason it appears that a single die run of 2000 Millennium 50 cent coins were run with a die variety. The cross on Union Jack in the Australian flag on the reverse is incuse rather than in relief as is normal. It is estimated that about 200,000 of these coins exist and they are worth $200 in uncirculated condition. Actually if you look for these coins you might be lucky enough to still find one. It wont be uncirculated but it will still be something of a scarce coin. 2010 Rotated or Upset 50 cent. That’s it for 50 cent coin values. There’s a bunch of NCLT issues of fifty cent coins that you might be lucky enough to find in circulation, and then there’s the ridiculously expensive gold 2009 50 cent coin but you wont find one of those any time soon!